America’s weak response to crises in Syria and Iran has left the nation’s credibility in tatters. We need to understand the real danger of this moment! The way America has handled recent events in the Middle East is deeply revealing—far more than most people realize. America is becoming a spectacle for the world to see, and not just because of the government shutdown and the political theater over the debt ceiling and Obamacare. The way this nation is managing its responsibilities worldwide is really about the death of a superpower, the end of an era, and the dawn of an extremely dangerous time! Few people recognize the real cause behind the world problems we see today. Even fewer recognize where events are leading and what is about to happen. America, in particular, is distracted and caught up in other “news.” Why are we so into our sports and Hollywood entertainment, when world-shattering crises are exploding in the Middle East and elsewhere? You need to understand what is going on and why. The war in Syria has been grinding on for over 2½ years. More than 120,000 Syrians have been killed. This past summer, intelligence sources reported that Bashar Assad used chemical weapons on his own people. Finally President Obama decided it was time to act, and he threatened to attack. Then something astonishing happened. The president had second thoughts and pulled back. And Russia’s president, Vladimir Putin, stepped in and presented himself as the great peacemaker of our time. This man has done more to keep Bashar Assad in power in Syria than any other leader in the world. Russian weapons have probably been the main factor preserving Assad’s rule! Putin’s backing of the Syrian regime is a major reason Assad has been so willing to slaughter his opposition by the tens of thousands. In addition, Putin wants to restrict America’s power in the Middle East—and everywhere else—and to strengthen his own. When it appeared America might attack Syria, Vladimir Putin put the brakes on—by offering up a sham proposal to secure Syria’s chemical weapons. He even wrote an article that the once-great New York Times shamefully published in its op-ed pages that was full of smooth-sounding hokum: Like it or not, we must uphold international law; we must stop resorting to force; we need civilized diplomatic and political settlement and so on. What a farce! This is the man who invaded Georgia just five years ago (without UN permission). The man who has ordered the elimination of tens of thousands of Chechens. The man who has openly supported Iran despite its sponsoring terrorism. He used to be an officer of the Soviet secret police. He is a great admirer of Stalin—who killed more of his own people than Adolf Hitler did! But what did President Obama do? He accepted Putin’s offer. He played along, pretending like this was the peaceful, negotiated solution he wanted. He even took credit for it, saying it was America’s pressure that convinced Assad to give in. Now Putin is conducting the peace process of all things! The Obama administration is trusting this man to put Assad’s weapons of mass destruction under international control and to guarantee Assad can no longer terrorize his people. Charles Krauthammer called this the worst failure ever in U.S. foreign policy. Commentary magazine labeled President Obama’s flip-flopping on Syria a “debacle,” and said it showed “staggering incompetence” by the White House. The whole spectacle was an embarrassment for the United States on a massive scale. But very few of our people see the deadly consequences. What About the Chemical Weapons? While all this phoniness was going on, what was Assad doing? The Wall Street Journal reported on September 12 that a “secretive Syrian military unit at the center of the Assad regime’s chemical weapons program has been moving stocks of poison gases and munitions to as many as 50 sites” (emphasis mine throughout). Naturally, with all the talk and the warnings to Syria that inspections were coming, the Assad regime just moved the weapons so nobody can find them. Maybe the United Nations and the U.S. knew where those chemicals were, but they probably don’t know anymore. Then, the day after the Journal ran its front-page article about the Syrians shielding their weapons arsenal, Secretary of State John Kerry made the deal with Russia to have Vladimir Putin oversee confiscating Syria’s weapons of mass destruction! This passes for a “solution” in this mad, mad world. Even a child can see the folly! But grown men are making these decisions. How can we be so naive? You can be sure that Iran was watching this whole process very closely. The same story has been happening with Iran over a period of years. Iran has broken its agreements with the United Nations over nuclear inspections around 20 times. The inspections never achieved anything. Iran just kept deceiving the UN, buying time to continue its nuclear activities—and the UN and the rest of the world played along. America’s threat of force with Syria would have gotten Iran’s attention. But when that blew over, Iran’s leaders must have had a good laugh over how incapable the U.S. actually is of taking action! Ray Takeyh is a senior fellow at the Council on Foreign Relations and a former senior adviser on Iran at the U.S. State Department. He told the Jerusalem Post that America’s handling of the Syrian issue probably left “the Iranians feeling somewhat advantaged.” What an understatement! “The international community’s reticence to use force and its referral of the matter to the cumbersome UN process offer them an opportunity to relax a bit,” he said. Iran feels more than “somewhat advantaged.” It knows that the U.S. is finished! There is nothing to stop its nuclear ambitions! And it isn’t going to relax—it is going to proceed full steam ahead! In case it wasn’t obvious enough that the Russian deal on Syria’s weapons was a sham, President Putin was even bolder. The day before the U.S. agreed to Russia’s plan for securing Syria’s chemical weapons, Putin met with Iranian President Hasan Rouhani during a summit in Asia. There Putin accepted an invitation to visit Iran—and offered to help Iran build a second nuclear reactor at the Bushehr nuclear plant! America says it wants to prevent Iran from getting nuclear weapons. But Russia openly supports Iran’s nuclear program—it even uses its veto on the Security Council to limit the UN’s ability to check that program—and Washington does nothing! It pretends like Russia is a perfectly reasonable partner in containing Syria! After making the deal to contain Syria’s chemical weapons, Russia offered to put troops in Syria to “monitor” the disarmament. It is taking full advantage of America’s weakness—essentially chasing America out of the region and cementing its own position there. The evidence is everywhere that America is dealing with an enemy in Russia! But everything the U.S. is doing is playing perfectly into Russia’s hands—and Iran’s. Yet its mishandling of these matters got even worse. Much of the international community appears to be deeply impressed with the new Iranian president, Hasan Rouhani. People are enamored with his supposed “moderate” inclinations. That is madness. Anyone who believes Rouhani is moderate has to ignore mountains of evidence to the contrary. Rouhani headed Iran’s Security Council from 1989 to 2003. During that time Iran’s henchmen murdered opposition leaders in a Berlin restaurant. They murdered 85 people at a Jewish community center in Argentina. They killed 19 American soldiers by blowing up the Khobar Towers in Saudi Arabia. How many Americans know about Iran’s nuclear facility at Isfahan? That was one of the nuclear plants being built while Hasan Rouhani was making promises to halt Iran’s nuclear program in 2006. Today, he brags about how he deceived the West. But Rouhani has recently said some nice things in front of cameras, and that is like a hallucinogenic drug to Western “intellectuals.” A Twitter account supposedly representing Rouhani recently began sending tweets (even though Twitter is banned in Iran). One tweet, sent on September 4, said, “As the sun is about to set here in #Tehran I wish all Jews, especially Iranian Jews, a blessed Rosh Hashanah.” For the rest of the month, mainstream media gushed over how monumental this moment was for Iran and the world. Why will these people believe a silly tweet—but won’t believe this man’s actions over a period of decades? The real danger here is America’s deadly foreign-policy weakness! The last week of September, Rouhani was scheduled to visit New York to attend the annual summit of the UN General Assembly. President Obama saw this as a golden opportunity. In the lead-up to the conference, the White House began signaling that the president wanted a photo-op handshake with Rouhani. The Iranians refused the offer. 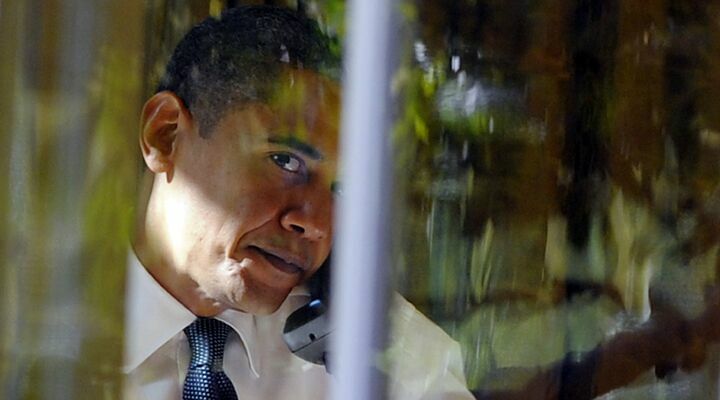 Mr. Obama signaled he would be open to taking a personal call from Rouhani. That was rebuffed too. Remember, Hasan Rouhani isn’t even Iran’s leader! The supreme leader is Ayatollah Khamanei—Iran’s president is like a puppet. For President Obama to be chasing after Rouhani doesn’t even make sense. But it is worse than that: In diplomatic language it degrades the American president’s office and sends a message of disgraceful weakness! Still, after the UN conference was over, on September 27, President Obama picked up the phone and personally called Rouhani. He caught him in his car on his way to the airport leaving New York. They talked for 15 minutes. This was the first “high-level conversation” between America and Iran in 30 years, and the foolish liberal American press hailed it as a victory for negotiation and peace. The truth is that President Obama’s phone call to Rouhani was the most shameful call ever made by a leader of this land! One conservative Washington Post writer said the phone call revealed Mr. Obama’s “undisguised desperation for a deal” (September 29). The failure in Syria put pressure on the president to make it look like he’s making progress with Iran. How pathetic! But do you think the president is regretting his 15-minute phone call of shame? That’s right—the president knows all about Iran’s supreme leader; nothing he agrees to with Rouhani makes a bit of difference if Khamanei doesn’t approve. And he is willing to put full faith in this supposed fatwa from Khamanei as evidence that Iran doesn’t want nukes! He has even more faith in this fatwa than the press has in Rouhani’s tweet. Never mind that there is no documentation of this supposed fatwa—that the only evidence it exists is a few Iranian representatives mentioning it in the media. Never mind that even if it does exist, it wouldn’t matter. As Patrick Clawson, director of research at the Washington Institute for Near East Policy, notes: “[F]atwas can change when the circumstances change. … It could be entirely appropriate for the supreme leader to say nuclear weapons are not appropriate, they’re against our religion—except for if we’re threatened by people with nuclear weapons.” During the Iran-Iraq war, Ayatollah Khamanei said, “Muslims must have the most advanced weapons that their enemies possess.” His predecessor, Ayatollah Ruhollah Khomeini, and other religious leaders have said that if it means the preservation of the Islamic republic, they have religious grounds to violate any principle of Islamic law! And never mind all the fatwas Khamenei and Iran’s other clerics have issued that authorize terrorism, torture and murder! Never mind the fact that Iran has pursued nuclear technology for decades and repeatedly lied about it! Never mind that Iran is building missiles whose only purpose is to deliver nuclear bombs! (article, page 4). America’s government is ready to reverse 30 years of foreign policy based on the assumed existence of a non-binding fatwa from a nation cloaked in decades of deception over its nuclear program! It is as if children are in charge of America’s foreign policy! What a spectacle America has become to the world! In Leviticus 26:19, God warned that if our peoples descended into sins, He would break the pride of our power. And so He has! What a terrible end to a superpower! America’s handling of Syria and Iran is a monumental disaster in our foreign policy. It is so bad that journalists are looking for new words to describe it. The nation’s enemies shake their fists at us at every turn and we let them get away with it. Our credibility is in tatters. America is being attacked from within and without. There are failures everywhere: economically, culturally, politically, militarily and morally. Anyone who says there isn’t a real problem here needs to open his eyes! We need to see what is happening to our nation. More importantly, we need to understand why it is happening—and why God is allowing it to happen! The reality is that something deadly dangerous has seized the country—far more than what people realize. There is a spiritual dimension to what is happening, and you cannot understand these events unless you recognize that. Ultimately, this isn’t about a man or an administration: It’s about an evil spirit being that is working to destroy this nation! Request a free copy of my booklet America Under Attack for an explanation of this extremely important truth, which you can prove from your Bible. We live in exceedingly dangerous times. We are talking about nuclear bombs! That makes America’s weakness all the more alarming and disgraceful. Many people—including high-profile academics and intellectuals within the U.S.—cheer the thought of America’s power coming to an end. But the same biblical prophecies that foretold America’s fall also reveal the nightmares that will unfold once other world powers take control. Jesus Christ prophesied about these problems in Matthew 24:21-22. He said “great tribulation” is coming that is worse than any in mankind’s long, tragic history! He warned that unless these perilous days were shortened,no flesh would be saved alive! Nuclear warfare is near! It is prophesied over 100 times in Bible prophecy! And you can prove it. But will you believe God? Or will you wait until it is too late physically to even respond to God? If not for divine intervention, the human race would face extinction! We live in a time of no more delay and are racing toward that prophetic fulfillment! Meanwhile, Americans pick up the remote and flip channels to see who is playing on espn. As they distract themselves, this world is about to explode! Man is about to set the world on fire! Soon, events will arrest the full attention of every person on this Earth. What we are seeing so far is only “the beginning of sorrows” (verse 8). Read the rest of Christ’s prophecy to see the other increasingly terrible events He told us to watch out for. But it culminates in the best news of all: “And then shall appear the sign of the Son of man in heaven: and then shall all the tribes of the earth mourn, and they shall see the Son of man coming in the clouds of heaven with power and great glory” (verse 30).